Da Capo Press, 9780306824500, 256pp. Corey Taylor has had it. Had it with the vagaries of human behavior and life in this postmodern digital blanked-out waiting room that passes for a world. Reality TV, awful music, terrible drivers, megamalls, airports, family reunions, bad fashion choices, other people's monstrous children, and badly-behaved "adult" human beings are warping life in the twenty-first century into an often-unbearable endurance test of one's patience, fortitude, and faith. Funny, profane, blasphemous, and above all right on target, You're Making Me Hate You is pure Corey Taylor unleashed, exposing the underbelly of human depravity in all its ragged glory. 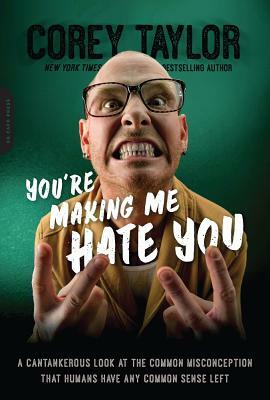 Corey Taylor is the New York Times bestselling author of Seven Deadly Sins, A Funny Thing Happened on the Way to Heaven, and You're Making Me Hate You. Lead singer of rock bands Slipknot and Stone Sour, Taylor has earned 11 Platinum records, 43 Gold records, and a Grammy. A native of Iowa, he spends his time between there, Las Vegas, and his suitcase.